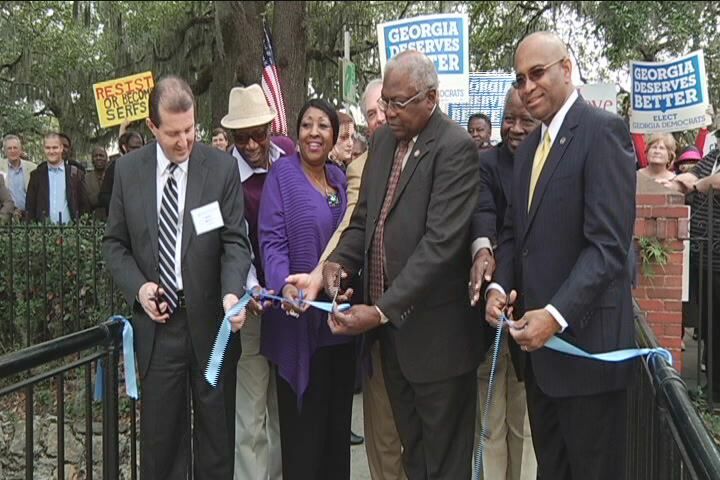 (Savannah, Georgia) - About 200 people attended the February 4, 2012 grand opening ceremony for the Democratic Party of Georgia's satellite office in Savannah. Those present included Democrats from Atlanta, Augusta and other cities across Georgia and South Carolina. The Savannah, Georgia area is home to the Chatham County Democratic Party. Party leaders and lawmakers on hand included Democratic Party of Georgia (DPG) Chairman Mike Berlon, U.S. Congressman James Clyburn (D-SC), Savannah Mayor Edna Jackson, Savannah City Councilman John Hall, Georgia State Senator Lester Jackson and Georgia State Representatives Bob Bryant, Craig Gordon, Mickey Stephens and Al Williams. The new Savannah office of the Democratic Party of Georgia is the latest example of the party's determination to re-elect Pres. Obama and to take back the state and national offices currently held by Republicans who are sponsoring evil legislation that is harmful to the low income residents of Georgia. (Scroll to end of this post to read Feb. 3, 2012 update from Democratic National Committee on re-electing President Obama and harmful Republican Legislation). Augustans in attendance for the Savannah event included Richmond County Democratic Party (RCDP) chair Dr. Lowell Greenbaum and Rev. Terence A. Dicks, a member of the RCDP who serves on the DPG state committee and is the Southern Regional Organizer for the Progessive Democrats of America (PDA) and PDA State of Georgia Coordinator. The opening of the Savannah office "is part of our 5% strategy," said Mike Berlon, DPG Chairman. Savannah residents will staff the office, located at 406 East Bay Street, after undergoing intensive training with the DPG. Georgia Democrats’ ultimate goal will be to provide a hub to organize, canvass and register new voters in Chatham County and beyond. (SAVANNAH, GA) - It was a big day for the Blue Party in Savannah. Democratic leaders from all over the region came into town to celebrate Savannah's first official Democratic Office. The space will provide a strategic location for Georgia democrats to organize campaign and register new voters. Before, the party worked from Atlanta - down. Party leaders, like Representative Mickey Stephens say a Savannah office just makes sense given the amount of support in the south. "Savannah has always been a Democratic city and Savannah went for Pres. Obama in the last election so we are making strides down here in the south and in the south end of the state and I think that’s why they opened the headquarters here." Democratic officials say this space will continue to bring future political success to southern and eastern Georgia along with strengthening grassroots efforts. SAVANNAH, GA (WTOC) - Some more popular politicians were also in the hostess city on Saturday to help open the Democratic party's office in Savannah. Congressman James Clyburn, plus local leaders, like Mayor Edna Jackson were on hand for the grand opening. Many believe the new office will have a big impact in this part of the state. Chairman Mike Berlon of the Democratic party of Georgia says, "the idea is we've got to get back to our roots. We have not really been actively involved in areas outside of Atlanta in a long time, and I think this is the first step to reclaim Georgia for the Democrats." Folks will staff the office after undergoing intensive training by the Democratic party of Georgia. The first satellite office of the Democratic Party of Georgia opened in Augusta (Garden City) on Saturday, March 26, 201. The Augusta event was the first state committee meeting under DPG Chairman Mike Berlon. The Augusta-Richmond County Democratic Party meets on the second Wednesday of every month at its headquarters on 11th and Greene Streets at 7:30PM. 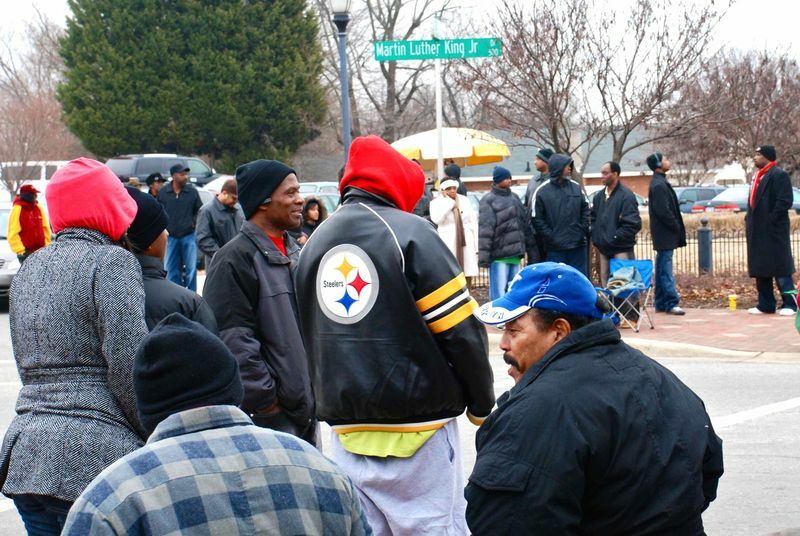 The party sponsors a breakfast the third Saturday of each month at a different site at 9 am. ADVANCED VOTING FOR MARCH 6 PRIMARY runs from Monday, Feb. 6 to Friday, March 2, 2012 from 9 am to 5 pm at the Municipal Building in Augusta. The polling place is at the Municipal Building on Greene St. The Democratic Party of Georgia has a plan to take the red out of the state, and they started it in Augusta on Saturday. “We stand ready to turn this state back to its true, blue color,” State Rep. Wayne Howard, D-Augusta, said. Howard introduced the state party’s new chairman, Mike Berlon, who received a standing ovation from the crowd of about 250 Democratic leaders. During a three-hour state committee meeting at Augusta’s Marriott Hotel & Suites, party officers gave reports and Berlon described his plan to keep the party active on the local level throughout the year, including opening regional field offices. At the end of the meeting, a grand opening reception was held at the state’s first satellite office at 1101 Greene St.
Treasurer Russell Edwards said Augusta is ideal for a satellite office because it is the second largest city in Georgia and has a large population of “under-served constituents,” including Korean-Americans and Latinos. State party spokesman Eric Gray said that, although the satellite office is in the same location as the county headquarters, it will better serve voters because it will be staffed daily. The meeting also focused on legal matters such as redistricting, voter IDs issues, the state party’s by-laws, finances and funding.